Find hotel near Sultan Omar Ali Saifuddie .. Built in a unity of Mughal architecture and Malay style, the Sultan Omar Ali Saifuddien Mosque is an architectural marvel one should not miss in their lifetime. 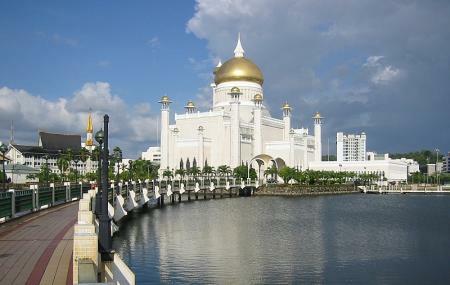 Nestled in the island city and capital of the Sultanate of Brunei, this mosque is often considered as the one of the most beautiful mosques in the Asia Pacific region. You can visit this mosque either to offer your routine prayers or event just go to experience its grandeur, peace and tranquility. Opened in the year 1958, this mosque is affiliated to the Sunni Islam and is a major historical site, and a famous tourist attraction of Brunei. Popular for its most recognizable feature the main dome covered in pure gold the mosque is open all days of the week. Really beautiful mosque. The view is very nice and there is a waterfront near the mosque. Really good and very well maintained. The mosque inside is very clean and tidy. Really recommend going there if you haven't. Very nice Mosque down by the waterfront. Great place to take photos and walk around it. You can get inside just not on Thursday afternoons, Fridays etc. If you want to go inside double check before you go. This was a place that I had to see but due to the fact it was raining I decided to take a picture and run. Later I realised this was such a beautiful place. This country is so beautiful and the history behind the mosque was eye opening. Next time I get the opportunity to travel back here I will actually try and make it to the mosque and I would advice that if you do travel over there, please make the time to visit the mosque. BEAUTIFUL.